Purpose: The purpose of this study was to determine dental hygienists' use of recommended techniques to communicate science–based information for intervention and prevention of oral disease. Methods: A 30–item survey containing 18 communication techniques representing 5 domains including 7 basic skills were mailed to a random sample of 1,258 Maryland dental hygienists to determine their use of recommended communication techniques. Results: The response rate was 43% (n=540). Nearly all were females (98%) and 58% practiced in solo settings. About half of respondents used 6 of the 18 techniques routinely. Approximately three–quarters of respondents reported they rarely or never used 3 of the 7 basic recommended techniques. Only one basic technique (use of simple language) was used by over 90%. Respondents who had taken a communications course other than in dental hygiene school were significantly more likely to use communication techniques on a routine basis than those who had not (p<0.01). Conclusion: Dental hygienists and their patients would benefit from using the recommended communication tools and techniques to address individual patient needs. To improve oral health outcomes, dental hygiene education must strengthen health literacy knowledge and communication skills in dental hygiene education programs and through continuing education courses for practicing hygienists. Healthy People 2020 identified several objectives specifically addressing communication skills of health care providers (Table I). The first 2 main goals are particularly relevant: improve the health literacy of the population, and increase the proportion of persons reporting that their health care providers have satisfactory communication skills.19 The related objectives are from the patient's perspective. The objectives for the first goal aim to increase the proportions of persons who report that their health care provider gave instructions they could understand and also confirmed their understanding. For the second goal, the objectives aim to increase those persons who report that their health care provider always listened carefully, explained things so they could understand, showed respect and spent enough time with them. One objective specifies that all current and future health care workers, dentists, dental hygienists, dental assistants and students of each discipline, should have education that includes the principles of effective communication and the use of plain language in practice. Dental hygienists have a significant role in the prevention of dental diseases by preventing the onset of the disease, recognizing it at early stages and providing patient education that encourages individuals to take an active role in preventing diseases and maintaining their oral health.24,30 Thus, there is a gap between what the evidence has shown to be effective in preventing dental caries and what the public actually understands and practices with regard to this evidence. Dental hygienists are essential communicators in bridging that gap.1 A study to understand the use of communication techniques by dental hygienists was undertaken as part of an overall investigation to enhance oral health literacy in Maryland. A self–administered questionnaire including items on communication techniques was used in this cross sectional descriptive study of Maryland dental hygienists. The Institutional Review Board at the University of Maryland approved the study. In May, June and July of 2010, data was collected by a mail survey to a random sample of 1,259 dental hygienists generated from a membership list provided by the Maryland Dental Hygienists' Association (MDHA). Eighteen items on recommended communication techniques used on a routine basis were included in a 30 item questionnaire designed to also elicit the respondent's knowledge and practice pertaining to dental caries prevention. The findings in this report are limited to the questions concerning hygienists' use of communication techniques. The items on communication were adapted from Rozier et al, and based on techniques recommended by the American Medical Association.4,20 The 18 questions that are grouped into 5 domains are shown in Figure 1. The 7 basic techniques comprise the first 2 domains (interpersonal communication and teach back method). Respondents were asked how often they used the 18 communication techniques in a typical workweek using a Likert–type scale of 5 options: always, most of the time, occasionally, rarely and never. For each technique they were asked whether they thought the technique was effective using a yes, no or don't know response. The instrument was pilot–tested among 6 practicing dental hygienists; it was then revised and printed in a format that could be returned without an envelope. Participation in the study was voluntary and passive consent to participate was given by completing and returning the survey. Three attempts were made to reach dental hygienists and request their response. The first mailing consisted of the full survey instrument with a cover letter signed by the president of the MDHA. Three weeks after the first mailing, a second complete mailing was sent with a modified cover letter from the president. Approximately 3 weeks after the second mailing, a postal card, also signed by the MDHA president, was mailed to remind the dental hygienist that we had not yet received the completed survey. We also asked the MDHA to send an email reminder to all dental hygienists urging them to respond to the survey as soon as possible. The outcome variable for analysis of the communication techniques was a count of the routine use of the 18 communication techniques. For the purpose of analysis, we also extracted 7 out of the 18 communication techniques as a separate outcome variable. Similar to Rozier et al, we defined routine use as use most of the time or always versus never, rarely or occasionally.4 We also asked respondents if they had ever assessed their office or clinic facilities and procedures to determine how user–friendly it is for patients. In addition, we asked if they were interested in attending a course on communication skills. The data was analyzed using SPSS version v18. Statistical analyses included descriptive statistics (frequencies and percentages), cross tabulation and chi square statistic. For the chi square test, the associations were examined between all demographic variables and the mean use of variables. Analysis of variance (ANOVA) of the selected predictor variables (demographics and the characteristics) were used as the independent variables and the dependent variable of the mean number of communication techniques used routinely. Ordinary least squares regression analysis of the selected predictor variables (demographics and practice characteristics) were used as the independent variables and the count of communication techniques routinely used in a week as the dependent variable. Because of the exploratory nature of the survey, the p–values were selected at 3 levels, p<0.10, p<0.05 and p<0.01. Of the 1,259 surveys sent, 579 were returned for a response rate of 46%. Of these, 540 were usable responses giving an effective response rate of 43%. Nearly all respondents were females (98%), most were White (83%), more than half practiced in a solo practice setting (58%) and about one–third were in group practices (35%). Approximately one–quarter graduated from their dental hygiene program in each of the previous 3 decades, and one–quarter graduated before 1980 (27%) (Table II). When asked what percent of their child patients had private insurance, the average response was 70%, while the average percent having Medicaid patients in their practice was 11%. The majority (66%) reported having taken a communication course other than that taught in their dental hygiene training. 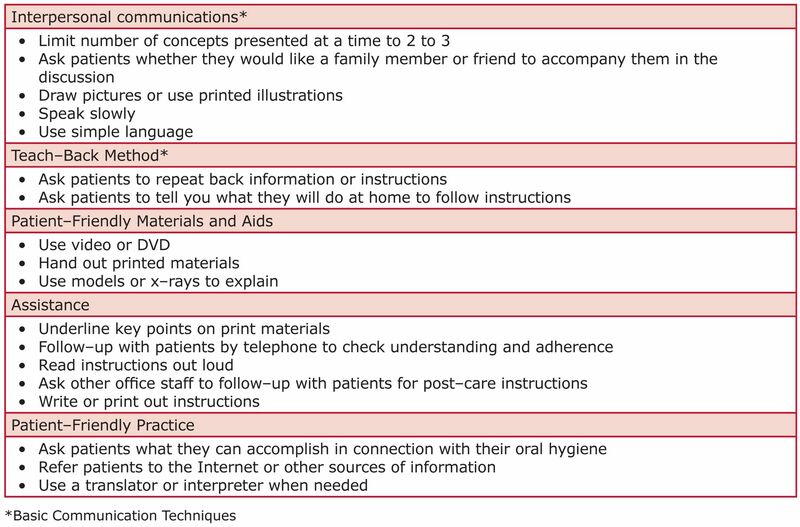 The 18 items regarding the communication techniques regularly used are grouped into 5 domains: interpersonal communication, teach back, patient–friendly materials and aids, assistance and patient–friendly practice.4 The percentage distribution for each of the 5 possible responses to each item is shown in Table III. The first 7 techniques included in the first 2 domains are considered to be basic skills that every health provider should use routinely. The mean response score for the routine use of each technique and domain are displayed in Figure 2. The frequency of use varied considerably across the 18 techniques and 5 domains. Dental hygienists reported routinely using an average of 6.95 of the 18 techniques and 3.71 of the 7 basic techniques during a typical work week. About 14% of respondents used 10 or more of the 18 techniques and 26% used 4 or more of the 7 basic techniques. Less than 5% used all 7 basic techniques. Only one basic technique (use simple language) was used routinely by nearly all respondents. Table IV presents the results from the bivariate analysis of the routine use of communication techniques by provider and practice characteristics. For provider characteristics, there was a significant relationship between race and the routine use of 18 techniques (p<0.01). The average routine use of the 18 techniques was greater for non–White (mean=7.96) than White providers (mean=6.76). The average use of the 18 techniques was greater for dental hygienists born in foreign countries than U.S. born dental hygienists (7.78 vs. 6.95, p<0.10). Dental hygienists who had taken a communication course used the 18 techniques more than those who had not had a communication course (7.28 vs. 6.31, p<0.001). The average use of the 18 techniques was greater for those who assessed their procedures and facility to determine how user–friendly it is for patients than those who did not (7.84 vs. 6.14, p<0.001). Of the 5 practice characteristics variables, the only significant variable was the percent of child patients covered by Medicaid (p<0.05). The mean number of the 18 techniques was the highest (9.28) for dental hygienists with 26 to 50% of child patients who were insured with Medicaid. For the use of the 7 basic techniques, the average use was higher for dental hygienists who had taken a communication course than those who had not taken a communication course (3.83 vs. 3.46, p<0.01). Those who assessed their offices for user friendliness routinely used 7 techniques more than those who did not assess their office (4.00 vs. 3.43, p<0.001). Of the 5 practice characteristics variables, the only significant variable was primary occupation (p<0.10). The mean number of communication techniques routinely used was higher for dental hygienists who reported “other” as their primary occupation than those whose primary occupation was private practice (p<0.10). 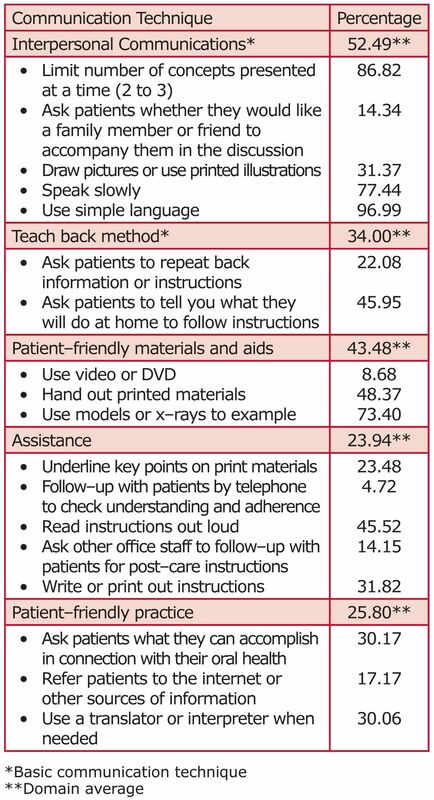 Table V shows responses of hygienists' beliefs about the effectiveness of the communication techniques. Most responses were distributed between the yes and don't know categories, with relatively few selecting no. For 5 of the techniques more than half the hygienists reported they did not know whether the techniques were effective and for another 4 techniques more than one–third of dental hygienists reported they did not know if the techniques were effective. Table VI presents the results from the multiple regression analysis with the communication techniques as the dependent variable. The results generally confirmed some of the associations that were observed in the bivariate analysis. The average number of routinely used 18 techniques was higher for non–White compared to White, but not for the 7 basic techniques. The number of the 18 techniques and 7 basic techniques was lower for those who did not assess their procedures and facility to determine how user–friendly it is for patients than those who did. Those who had a communication course outside of their basic dental hygiene training were more likely than those who did not have such a course to routinely use either 18 techniques or 7 basic techniques (p<0.001). This investigation is one of the first to report dental hygienists' use of these recommended communication techniques. The routine use of communication techniques by dental hygienists varied greatly. A national survey supported by the ADA and reported by Horowitz et al using similar questions to those used in this study found that nearly 10% of dental hygienists asked patients to repeat instructions (teach back) and 31% reported they asked their patients to tell them what they would do at home to follow instructions.31 In contrast, 22% of dental hygienists in the current study reported routine use of teach back and 46 % asked their patients to tell them what they would do at home to follow instructions. Several important factors influenced the use of the 18 communication techniques. Dental hygienists who had taken a communications course other than in dental hygiene school clearly used more of the 18 communication techniques. A related factor was those who assessed their offices for user friendliness also used more of the 18 techniques than those who had not. These findings lend strong support for including communications courses as required curriculum in schools of dental hygiene and as options for continuing education by dental hygiene associations and dental hygiene programs. The mean number of 18 techniques used by hygienists was most strongly influenced by the average percentage of Medicaid patients in their respective practice. This finding might reflect the hygienists' perception of just how much Medicaid patients need skills and understanding and thus use more communication techniques to help them understand. For the 7 basic techniques, having had a communications course and assessing their practice for user friendliness were major factors in an increased use of communications techniques. The fact that dental hygienists who practice in “other than private practice,” in other words, such as public health clinics and hospitals, also used more of the 7 basic techniques than did those in private practice is not surprising because many Medicaid and other low socio–economic status patients likely seek care in these facilities. A patient health literacy assessment in a dental hygiene program found that a significant number of patients had marginal literacy skills indicating a need for attention to health literacy in the curriculum.33 Although tools and techniques are available to assist health care providers, their use by dental hygienists is not known. For example, Health Literacy, Universal Precautions Toolkit has been produced by the Agency for Health Care and Quality, and dental hygienists and their patients would benefit from adapting these to their practices.34,35 Intervention studies are needed to determine which specific adaptations are most useful in various practice settings with different patients. While the response rate (43%) was similar to other health care provider surveys and is reasonably good for a mail survey for health providers,36 the generalizability may be limited. Selection bias is possible in that the responses of the survey participants may not reflect the views of non–responders. Providers who returned the survey were likely to be more interested in the topic than those who did not. Further, the validity of the participants' assessment of their communication also may be questioned given that direct observation could more accurately determine the type and quality of dental hygienist–patient communication. Despite these limitations, this study provides us with excellent baseline information upon which to develop and implement educational interventions and policies in Maryland. Dental hygienists can incorporate the routine use of recommended communication techniques if they have the knowledge, understanding and skills. In undergraduate education programs it is important that dental hygiene students receive appropriate training by educators with communication expertise and that their clinical experiences include skills training and evaluation in the use of recommended communication techniques. Continuing education courses can address these gaps for practicing dental hygienists. The purpose of this study was to determine the use of recommended communication techniques by Maryland dental hygienists. The results were similar to other studies that dictate a need for attention to communication skills in undergraduate curriculum and post–graduate continuing education offerings. Improved communication techniques can reduce the gaps in patient understanding and increase the likelihood of adequate and appropriate patient self–care leading to improved oral health outcomes. The authors thank Quynh Tu Tran, MPH, for her assistance in developing the tables. This study was supported by a grant from the DentaQuest Foundation. Alice M. Horowitz, PhD, is a research associate professor, Department of Behavior and Community Health, School of Public Health, University of Maryland. Joanne C. Clovis, RDH, PhD, is a professor at the School of Dental Hygiene, Faculty of Dentistry, Dalhousie University, Halifax, Nova Scotia, Canada. Min Qi Wang, PhD, is a professor at the Department of Behavior and Community Health, School of Public Health, University of Maryland. Dushanka V. Kleinman, DDS, MScD, is a professor and associate dean for research at the School of Public health, University of Maryland.
. The public's oral health: The gaps between what we know and what we practice. Adv Dent Res. 1995;9(2):91–95.
. Oral health literacy: the new imperative to better oral health. Dent Clin North Am. 2008;52(2):333–344.
. Health education & promotion to prevent dental caries. The opportunity and responsibility of dental hygienists. Dent Hyg (Chic). 1983;57(5):8–10.
. Dentist–patient communication techniques used in the United States The results of a national survey. J Am Dent Assoc. 2011;142(5):518–530.
. The health literacy of America's adults: Results from the 2003 national assessment of adult literacy (NCES2006–483). National Center for Education Statistics. 2006.
. Oral health literacy among adult patients seeking dental care. J Am Dent Assoc. 2007;138(9):1199–1208.
. Health literacy skills of US adults. Am J Health Behav. 2007;31(supp):8–18.
. The invisible barrier: literacy and its relationship with oral health. A report of a workgroup sponsored by the National Institute of Dental and Craniofacial Research, National Institute of Health, U.S. Public Health Service, Department of Health and Human Services. J Public Health Dent. 2005;65(3):174–182.
. Meta–analysis of correlates of provider behavior in medical encounters. Med Care. 1988;26(7):657–675.
. Literacy and learning in health care. Pediatrics. 2009;124(Suppl 3):S275–S281.
. Health literacy and child health promotion: implications for research, clinical care, and public policy. Pediatrics. 2009;124(Suppl 3):S306–S314.
. Literacy and child health: a systematic review. Arch Pediatr Adolesc Med. 2009;163(2):131–140. Committee Opinion No. 491: Health Literacy. Obstet Gynecol. 2011;117(5):1250–1253.
. Trends in oral health status: United States, 1988–1994 and 1999–2004. Vital Health Stat 11. 2007;(248):1–92.
. Trends in oral health by poverty status as measured by Healthy People 2010 objectives. Public Health Rep. 2010;125(6):817–830. Oral Health Objectives. 2020 Topics and Objectives. U.S. Department of Health and Human Services. 2011.
. Communication techniques for patients with low health literacy: a survey of physicians, nurses, and pharmacists. Am J Health Behav. 2007;31(Supp 1):96–104.
. A collaborative approach for improving information literacy skills of dental hygiene students. Int J Dent Hyg. 2003;1(1):49–56.
. Moving research knowledge into dental hygiene practice. J Dent Hyg. 2008;82(2):21.
. Adult clients' recall of oral health education services received in private practice. J Dent Hyg. 1995;69(5):202–211.
. Dental hygienists' knowledge and opinions about fluorides and fluoridation. J Public Health Dent. 1990;50(4):227–234.
. Health promotion behaviors of private practice dental hygienists. J Dent Hyg. 1991;65(5):222–230.
. Motivating mothers to prevent caries: confirming the beneficial effect of counseling. J Am Dent Assoc. 2006;137(6):789–793.
. Dental hygienists' views on communicative factors and interpersonal processes in prevention and treatment of periodontal disease. Int J Dent Hyg. 2010;8(3):213–218.
. The influence of patient education by the dental hygienist: acceptance of the fluorescence oral cancer exam. J Dent Hyg. 2009;83(3):134–140.
. The role of dental hygienists in oral health prevention. Oral Health Prev Dent. 2004;2(Suppl 1):277–281.
. Communicating with Patients: A national survey of dental team members. Meeting of the American Public Health Association. Philadelphia, 2009 November 10.
. Provider percentpsions of limited health literacy in communicty health centers. Patient Edu Couns. 2007;69(1–3):114–120.
. Introduction of Health Literacy into the Allied Dental Curriculum: First Steps and Plans for the Future. J Dent Educ. 2010;74(3):318–324. National Action Plan to Improve Health Literacy. U.S. Department of Health and Human Services, Office of Disease Prevention and Health Promotion. 2010.
. Methodologies for improving response rates in surveys of physicians: a systematic review. Eval Health Prof. 2007;30(4):303–321.